First sentence: "In a land called Bukovyna, in Ukraine, a husband and wife farmed their narrow strip of land." 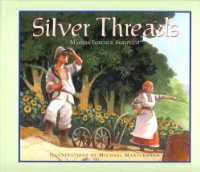 Publisher's Summary: "Silver Threads is the magical story of Anna and Ivan, two young newly-weds who escape poverty and hardship in Ukraine to start a new life on the Canadian frontier. As they struggle to build their homestead, World War I breaks out. And when Ivan volunteers to fight for his new homeland, tragedy strikes. While Anna works and waits alone, hope comes from an unexpected source. Based on true events, Silver Threads is a stirring lesson in history and a heart-warming tale of love and faith." Acquired: Borrowed a copy from my local library. 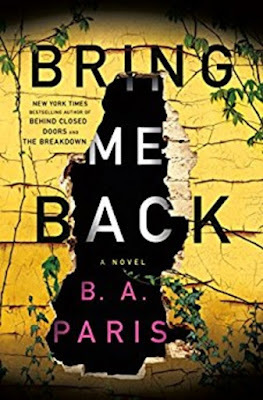 Reason for Reading: After reading Marsha's novel Prisoners in the Promised Land, I learned that her very first book was on the same topic and requested in from my library right away. This is a picture book suited to the elementary grades and based on the true story of the author's grandfather, George Forchuk, who was sent to a Ukrainian internment camp for the duration of WWI as a Canadian immigrant from the Ukraine. The story is a tender one of love and hope as the wife waits year after year for her husband to return to her as he promised, to spend another Christmas with her yet. A lovely little story that doesn't go deep into any of its particular topics but stays age appropriate for young elementary. It does emphasize historically the fact that Canada advertised in Eastern Europe for immigrants to come settle and farm in Western Canada. This makes the Ukrainian internment during WWI especially bitter since these people were invited to come here in the first place. But the story pays more attention to the hardships Ivan and Anna endured cutting down trees, removing stumps, planting a small part of their land that first year. Then Anna's time on her own and finally after the war wondering if Ivan was alive or dead, whether he would return home or whether she would be kicked off her land because she had not been able to continue their promise of clearing some land each year. Throughout all this hardship Anna and Ivan remain determined, full of hope and know that together they will always pull through. Michael Martchenko is one of Canada's eminent children's illustrators and the book is wonderfully illustrated with realistic paintings of the period. A charming book! Thank you so much for your lovely comments about my very first book. It was a dream come true for me in 1996 when it was published, and best of all, to have it illustrated by Michael Martchenko. He was shortlisted for the Amelia Frances Howard Gibbon Award for illustration for this book. I think he is one of the most gifted artists in existence.